One of India’s busiest actors, Anupam Kher is known for his prodigious body of work – 421 screen appearances! – not just in India but around the world, on the BBC, American network television, drama, comedy, period stories and contemporary works. Kher takes on a devastating event in Hotel Mumbai, a gripping minute by minute feature on the terrorist attacks on India’s Taj Mahal Palace hotel in Mumbai November 2008. Thirty-one hotel guests and staff are murdered by a handful of young terrorists sent from Pakistan over four days. 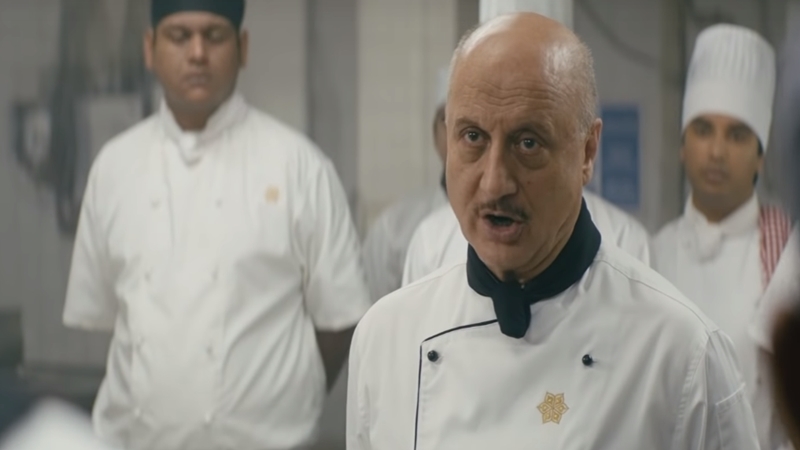 Kher plays Chef Oberoi, who calmly and skillfully managed the situation inside the hotel as best he could, saving lives of guests by shepherding them to safety within the hotel and keeping order with strength and compassion. Kher was close to The Taj during the attacks in 2008 and carries strong memories. He told me it was important to make the film during our conversation in Toronto. We screened Hotel Mumbai the day of the murders in Christchurch, which brought terrorism into sharp focus. What are your memories of the Mumbai attacks? I was in Mumbai shooting when this happened, we were eight miles away from the hotel. We thought it was a gang war shootout, no one realised and then it dawned on us it was a terrorist attack on Mumbai. People were shooting randomly at the registration counter, killing randomly. This was the beginning of the capture, of the siege of the hotel. I felt nothing but numbness, it was a complete shock and that it can happen to an iconic secure prestigious hotel like the Taj. The ordinariness of that situation you never think its possible. Restricted less crowded, people go to hotels to get security, they want to feel private. This was happening and it kept happening and there was no end to it. People were dying, it was real blood. I felt angry and helpless. You need to know these things, slowly, slowly information came out. My friend’s cousin was staying there, the general manager was in the hotel and he lost his wife and two young children. The familiarity of the whole thing. It’s like the 9/11 attacks on TV when you saw the second tower fall and the man falling, you feel shock, the shock no one who saw that will ever forget. You shut your eyes, you exactly see the falling. Similarly, I still remember the Taj where I’d gone to eat, meet people, attend events, after première parties. And to think that in every room, someone knocked and says “Room service” and shoots. The blast in the right wing of the hotel. Its so clear. Its important sometimes to the film. Its not just about the cowardly attack but the heroes who helped the others, not jus my character but the junior chefs, the guests who helped each other, we have to see it from that point of view, the truth. But the worlds of those killed, their families and friends are changed forever. How many have died in Mumbai in Christchurch, or the horrific attack or 9/11 or anywhere in the world? Other news will take over but what will happen to the victims’ families? You play Chef Oberoi, a man who runs a high-pressure kitchen and whose skills make him the natural leader in trying to save the hotel hostages, the hero. How did you get into his skin? That’s why it was an edge of the seat experience and a revelation to me. As an actor I couldn’t depend on the craft. It had to depend on the truth of my emotions. A brilliant actor knows this was not craft; you had to be in the person. In Chef Oberoi you feel the emotion was 100% there. There was nothing I could do which could depend on the craft, it was from the heart, fear and trauma. And he couldn’t show his emotions because he was in charge. The film is about unlikely heroes, the difference is empathy. That’s what the world needs. Did you ever meet Chef Oberoi? I had met him socially chef of a famous hotel and I was an actor so we would meet once in a while. He would say hello to me, but I felt it would be insensitive to ask him what happened that day. But when the film premiered in London, he was in the audience. I knew he’d come and he was introduced in the stage. I was in a white tailored white suit, which was eerie. I never cried so much. This was the hero. There was a never ending standing ovation, he said thank you to me, that was the biggest reward, the best trophy I could have. He said “You captured me. You where not there but you captured it unbelievably. Thank you.” I didn’t feel happy as much as humbled. He is a lesson in empathy and action. Not everyone could help in a crisis. The only problem is, we are too wary of a person sitting next to us in a train or in a public place. Before technology we chatted with people and understand their points of views, now everyone sits with their neck down looking at their phones. There is no connection. That’s what the film is about – compassion and getting jolted. It’s a hopeless situation. You have worked all over the world, consistently for decades. You have seen a lot of cultures and societies and appeared in so many stories about people. I am very proud because I come from a small town up in north India. My father was a ranger for the Forest Department and we were a poor family. I look back and think of the people that inspired me reading books about Chaplin and others and thinking this is how my life was in the beginning. I can inspire people with hard work and honesty. That’s what carries your forward. I may not have had the best career ever, but I’ve had the best life ever. I’m walking in the world completely clean. You mist have obstacles and ups and downs but I can’t help but think, oh, my God, this was a great journey!